Roboseyo: Not the FULL meaning of life, but a good chunk of it, I think. Not the FULL meaning of life, but a good chunk of it, I think. Finally: yes, it's true. 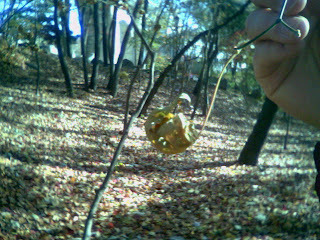 Fall is gasping into winter here in Korea. Last night I chatted with friends, eating sushi, and looked out the window as the wind showered leaves down from the trees onto the street. Huge floppy leaves streamed into a dark little side street. No picture, but it was sure beautiful. 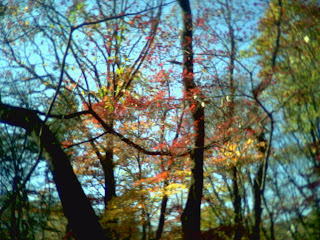 Fall is waning, and the multicoloured leaves are falling fast, to make room for winter's starkness. Unfortunately, some of those leaf piles concealed restaurants' compost bags, so it was a bit risky to stomp through them, and this pile (and many others) were big enough to conceal a sleeping hobo (who prefer to be left alone, rather than kicked by big kids like me), so I was a little cautious dragging my feet through them and letting the leafy crunchy sound fill my head up with happy-sauce and happy-sense. 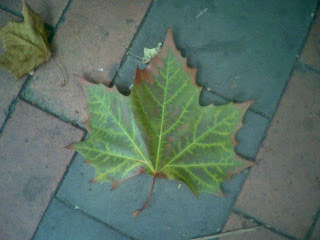 I love the vein pattern of these kinds of leaves. Today is Sunday. I walked with Matt for a good two hours this afternoon, on a riverside, a hill, and a university campus, talking (which was nice) but basically just being out in the middle of fall, letting the wind blow around us, and being alive. Fall in Korea is heaven, I swear. Even in the city, and even more in the country. Trees are so beautiful. In the words of Annie Dillard: "You are God. You want to make a forest, something to hold the soil, lock up solar energy, and give off oxygen. Wouldn't it be simpler just to rough in a slab of chemicals, a green acre of goo?" 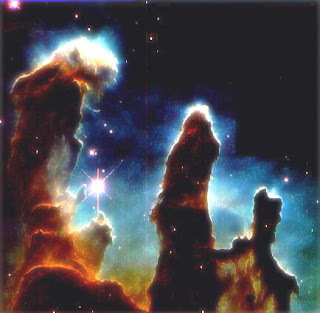 Sure glad God decided to go for the glamour and make something really, really, ridiculously good-looking instead. My friend Anna once used the word gratuitous, as in "We have a gratuitous god" and I'd have to say the beauty set into the world around us is absolutely gratuitous -- totally unnecessary! Beauty for beauty's sake alone! Almost shocking to my sensibilities, if I actually think about it, and definitely an apalling degree of overkill -- one tree ought to be enough beauty for any city in its entirety, yet instead, we're just overwhelmed by them, so much that we don't even think twice about cutting down these miracles of beauty and function! 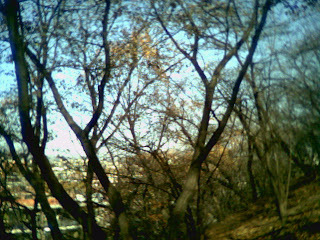 Trees and colours against the sky: here's late fall in Seoul (today was the first properly cold day in Seoul -- gloves instead of pockets, heavy coats instead of layers). Yet somehow the bamboo trees kept ALL their green. Next: a path. With colours. I wish you could have been there. 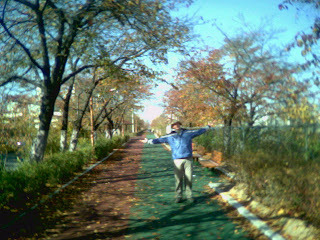 The green and red on the path is recycled car tires or something -- it makes the surface very pleasant and springy for walking or jogging. Certain trees' leaves curl up like a hand when the cold gets to them. It's a bit hard to see this one, but imagine an entire tree where instead of falling, the leaves have curled up into fists -- not unlike some people who curl themselves up in the cold (instead of just going inside). Almost like Christmas tree ornaments. 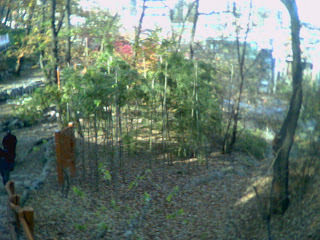 This was a little tree grove in Kyunghee university: every leaf colour imaginable was somewhere in the grove, layered above and below the other colours. 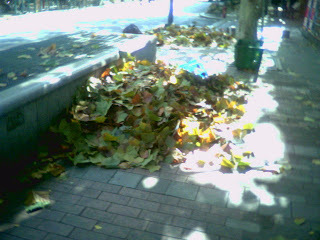 The leaves hadn't been swept up or rained upon, so they gave a really nice crunch underfoot. 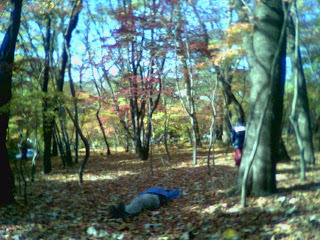 Matt and I lay down on our backs and stared up at the layers of leaf-colours and bare branches. Like this. There were a few hundred birds in the grove, pipping and singing away, and the people walking by gave the ground a rustle. The sun was just low enough in the sky to come in from the side, and it was as if the sunlight plugged the colours in, threw a switch and set them blazing. 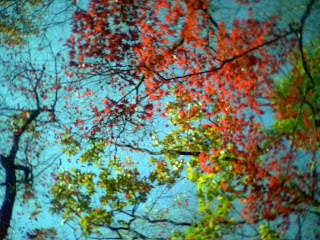 This (below) was the view from on our backs, looking up at the leaves. The sun and the leaves and the breeze and the birds joined together in an act either of love or of worship (or maybe both, if that's not too blasphemous or superlative for you). 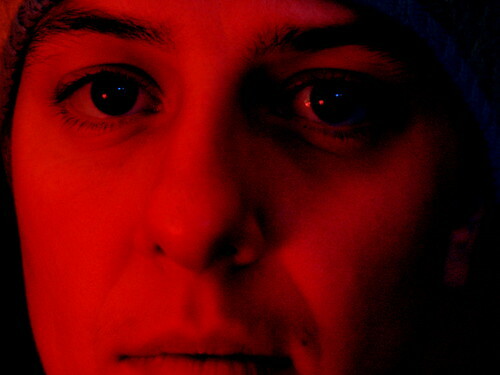 It was cold enough to see our breath, and every direction had a different mix of colours. The picture is two dimensional so it's hard to see how the leaves were layered one above the other, but I tell you, the rocks and trees were singing today. After five or ten minutes (or maybe it was thirty seconds, or maybe it was five days -- it doesn't matter) Matt stood up and said to me, "Congratulations. You have taken part in a perfect moment in time." And he couldn't have been more right if a voice from the sky had spoken along with him, and then a mysterious hand had materialized and given him a high-five. 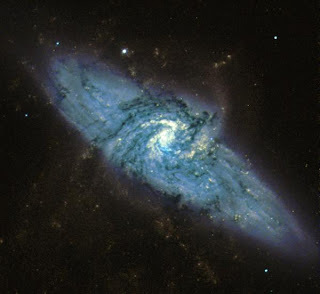 I can't find the exact quote, but I came across a spot where Steven Hawking said something to the effect that, of all the possible universes that could have existed, isn't it interesting that the one we live in, the one that DID come about, was one that contained creatures who could contemplate it, and wonder at it. 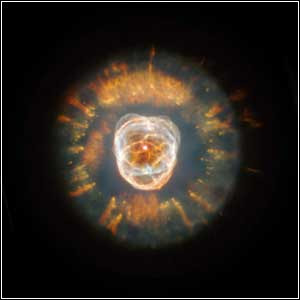 Whether this leads us to proof of some creator or not, the fact remains, the universe constantly screams out "HERE I AM! BE AMAZED! ", and we, humans, are lucky enough to have the capacity to do exactly that, and from there, even to search for a meaning to it all. Thank God! Framed in religious terms, the entire world was worshipping God today, and calling all the people in Seoul to worship with it. It was absolutely transcendental, and yet also absolutely embodied, rooted in the Here and Now of creation, and I don't know if there needs to be any more meaning to an autumn day than "Autumn is beautiful" and "Here I am! 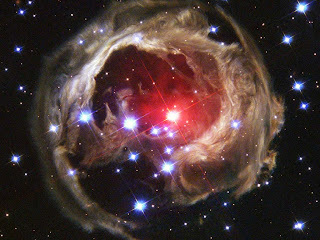 Be amazed!". Here it is. Be amazed. The earth is visible in this picture of Saturn. And look at this one again, too. Just soak it in. It's as beautiful as a liturgy. . . I don't know if the picture is, but the moment sure was. A chapel is a beautiful place to worship, sometimes (I'm thinking of those cathedrals that create a space of holiness by their mere design). . . but when God builds a place of worship, it's never exactly the same for two days in a row, and that says something. Sometimes I think that's enough meaning for life -- just that it's so darn full of beauty. Some stories have no real meaning except "here's a great story" and some autumn days are the same, and seeing that, and accepting and enjoying it for exactly what it is: breathtaking beauty -- is an act of worship to whichever deity one chooses to credit. I'm glad I'm alive! Thanks, God, for giving me senses! 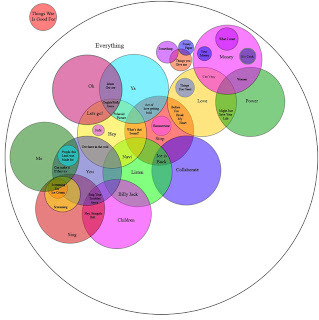 how many song references can you spot/recognize in this chart? It's Autumn in Korea. . . hang in there and I'll tell you about it. If you remember Josh Barkey from university, here's his blog, and a post that I really enjoyed -- a cool perspective on sin, if you will. Some pictures, just to increase the tease. 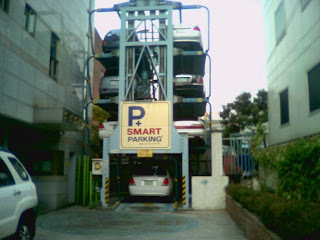 In a city as crowded as Seoul, sometimes parking solutions get creative. 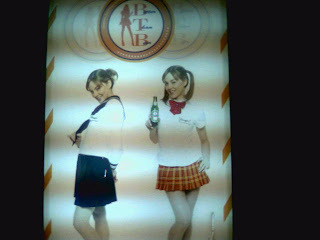 From a hostess bar: white fetish, schoolgirl fetish, the name of the bar (if you can't see it) is "better than beer". Matt and I decided there were probably no white girls OR school uniforms on the premises. 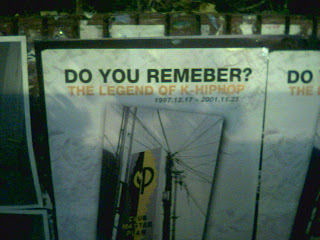 . . and it wouldn't take much for it to be better than beer anyway, given the quality of Korea's local brews. Won't find me in there checking, though. HMWAH! I laughed out loud when you asked about my parents. Sheer, random chance, my friend. Sheer, random chance. Between the drug dealing, alcoholic father and the emotionally chaotic, overly controlling mother, your guess is as good as mine. At a later date, I may have softer feelings towards my parents. This is a goal of mine. I may even give them more credit, which in my heart of hearts I know is their due. Especially my mom. If anyone could make up for my fathers' deficiencies, it was my mom. I know about your shiny things! I read your post before I wrote mine, and in large part YOUR post was the inspiration for my addendum that the world is lovely, and it is only we who are unlovely at times. YOU know I believe in the fasinating, beautiful, wonderful, miraculous, weeping with potential humanity we live in...sometimes I lament, but always I know we are beautiful. I also see the world with ecstatic energy as you do, and rejoice! It was just not the subject of this past post of mine. I often find it difficult to do justice to beauty, but you do it well. You put Milton to shame. milton, eh? thats pretty flippin' high praise. If you'd said John Keats or Gerard Manley Hopkins I'dve known you were overdoing it and called bullocks on you, but as it is. . . 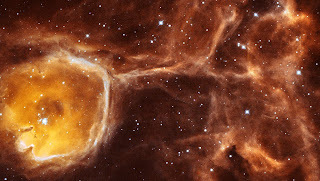 I know you're amazed by humanity -- that's why things like hypothermic, comatose, dead-drunk 14-year olds break your heart, because the potential can go THAT way, too. it's hard to write about beauty without going all tintern abbey and adding a bunch of unnecessary expostulation. even I do it. 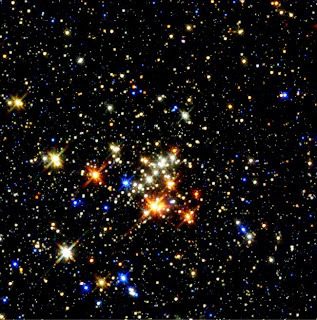 . . but maybe placing beauty in the context of a universe of wonders is necessary. . . or it's just that it's so flippin' hard to gaze intensely enough at something, and write intensely enough about it, that one could convey the full beauty without adding any extra pontification (ie, "the meaning of beauty. . . "). thanks again, though, for the praise. I don't like Keats. Never have. Yes, I'm weird. Yikes! You changed your picture on me and scared the pants off me. What's with the glasses? Funny how the unexpected can take you off guard! I stole the glasses from a pal, and they really suited me, so we took a picture. That's all. Funny how a little thing like that'll totally startle a person sometimes. Ernest! 3 things made me think of you lately: a lady named Irma who works at the administration building of my school district; a Korean-American who teaches at my school; Tanya Martins coming through town and asking who I still kept in contact with. Anyway, thanks for that wonderful meditation on beauty. Loved the pictures. I'm just starting writers notebooks with my 5th grade class. I'll try to check your blog more often for inspiration! this was such a stellar post, a mediation. perfect and wonderful. big floppy leaves. love & worship. perfect. thank you. thanks for your comments, everyone! i'm glad you liked it. Irma: so good to see you here! glad to know you stop by.